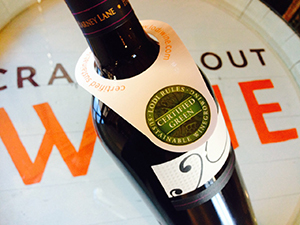 The Lodi Rules Certified Green label adorns a bottle of wine. Photo courtesy of Lodi Winegrape Commission. The Zinfandel Capital of the World in Lodi, California is located in the northern part of the Golden State’s central valley. The area is a growing center of sustainable viticulture and wine production, according to Matthew Hoffman, grower program coordinator of the Lodi Winegrape Commission. The Lodi Rules for Sustainable Winegrowing is the first such program in California certified by a third party, Protected Harvest, an independent certifier. The organization also produced the Lodi Winegrower’s Workbook, which specifically addresses many aspects of sustainability. It promotes sustainable habitats for area wildlife (which also serve as natural pest control), and encourages the preservation of local endangered species, including the Valley elderberry longhorned beetle. For example, growers may farm in the beetle’s presence if they plant elderberry bushes for the beetle to live in. The workbook also stresses the importance of utilizing a soil erosion management plan, and maximizing water efficiency by using drip irrigation. Alternative power sources (i.e., solar) are encouraged, as is the use of alternative fuels. Recycling is seen as a must for a farm to be sustainable. Original Lodi Rules growing standards began in 2005. It centers on a comprehensive approach, and includes pest management, biodiversity, water and air quality, soil health, employee well-being and community well-being. A total of 101 farming standards are outlined in the Lodi Rules, which are designed to improve the health of the environment, local ecosystem and society, and to enhance wine quality. All Lodi Rules farming standards are peer-reviewed by scientists, academicians and environmental groups prior to accreditation. For a winery to be Lodi Rules-certified it must meet two criteria: farming practice standards and a pesticide measurement maximum threshold. Third party auditors inspect farms each year for verification. In 2013, 27,000 acres were certified, and 20 area wineries produce wine with the Lodi Rules seal. For a bottle to wear this label, at least 85 percent of its grapes must come from certified sustainable vineyards. For some grape growers, sustainability was in place long before the Lodi Rules. One such vineyard is Goehring Vineyards in Clements, California, where Brad Goehring and others grow Petite Sirah grapes. Hoffman points out that the Lodi Rules are not one-size-fits-all, but guidelines. And in the same accord, wineries are not pressured to gain Lodi Rules certification. The Lodi Winegrape Commission was launched in 1992, and administers the area’s sustainable winegrowing programs. The organization engages in grower outreach and implementation of both field and area-wide sustainability, in addition to certification. Growers must pay $1,500 in the first year and $1,200 every subsequent year for the opportunity to be Lodi Rules-certified, and Hoffman views this as an opportunity to add value to an already good product.